The Community Phone team is proud to send out our sixth monthly TeleGraham, where we share some exciting news and profile a few of our most creative customers. This was arguably our most exciting month yet. Welcome to our new customers! As a little reminder, our plans start at $25/month and all come with unlimited calls and texts. New smartphones, including iPhones, start at only $5/month. Also, with our Care To Share Program, if someone signs up for our service with your recommendation, you both receive a free month of cell service up to $75 each! Community Phone was featured on the front cover of the January 5th Boston Globe! Technology and business reporter Andy Rosen interviewed the Community Phone team over several days, exploring what makes our mission unique, how we have been able to grow so quickly, and why our customers are so very special. We hope you check it out! In the monthly Member Spotlight, we showcase one of our wonderful members, to show how extraordinary members in the Community really are. 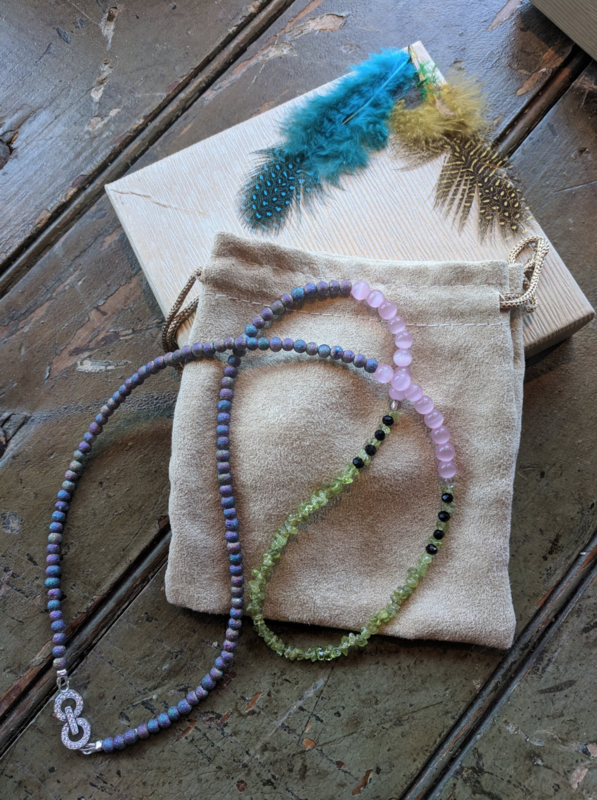 This month’s spotlight features the talented Lori Hubner, whose beautiful jewelry mirrors her personal journey into wholistic healing. To give Lori’s work the coverage it deserves, we’ve chosen to include a digital exhibit showcasing her favorite pieces. Under each image you can learn a bit about Lori’s process and inspiration. We conclude with a brief interview with Lori about her journey into jewelry design. “Little Mouse Dreams in Winter”: Unakite, a pink and green jasper, is mined in the North Carolina Unikas Mountains. A heart and mind healing mineral, it can help balance spirit and emotions; it can help one move from outgrown beliefs towards the New. It is helpful in releasing energy blockages. In this necklace, Little Mouse (hand carved Japanese boxwood) is curled up, dreaming of Spring. 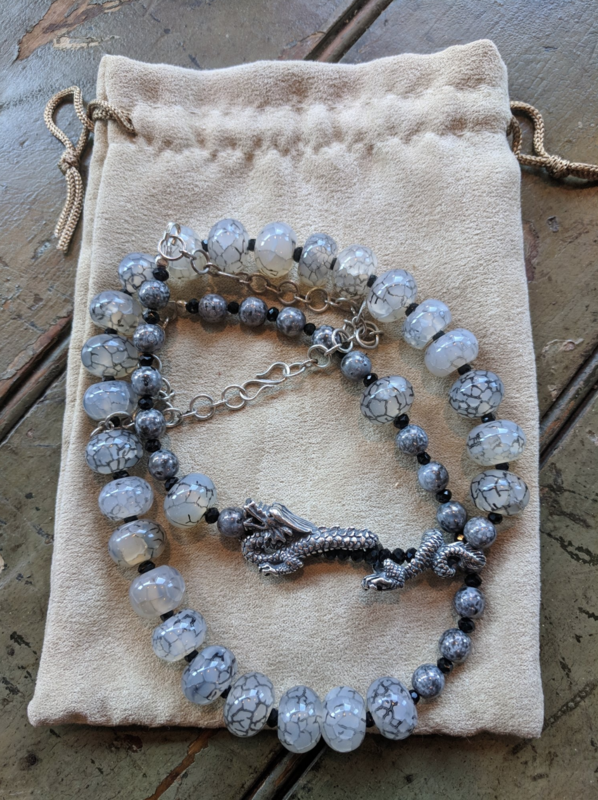 “Homage to Game of Thrones” : This 32” adjustable necklace features sterling silver findings and a spectacular 2 3/4” sterling dragon. Beadwork consists of 2 types of Czech glass and veined quartz beads, reminiscent of dragon scales. “Furnace”: From volcanoes come lava and grey stone. Glass beads are fired by the artist in a furnace. 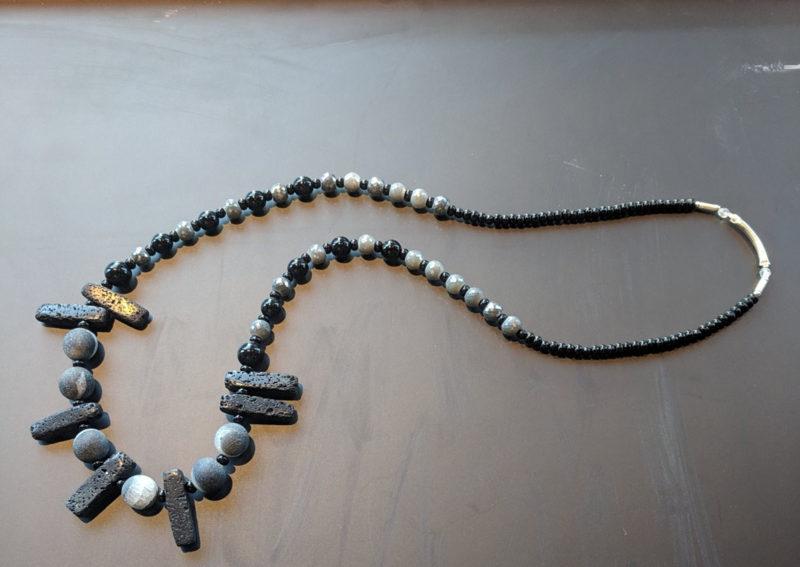 This 24” necklace is a fused statement of art and nature in minerals, glass, Swarovski crystals, and sterling silver. Wear it, and feel the energies of Creation. 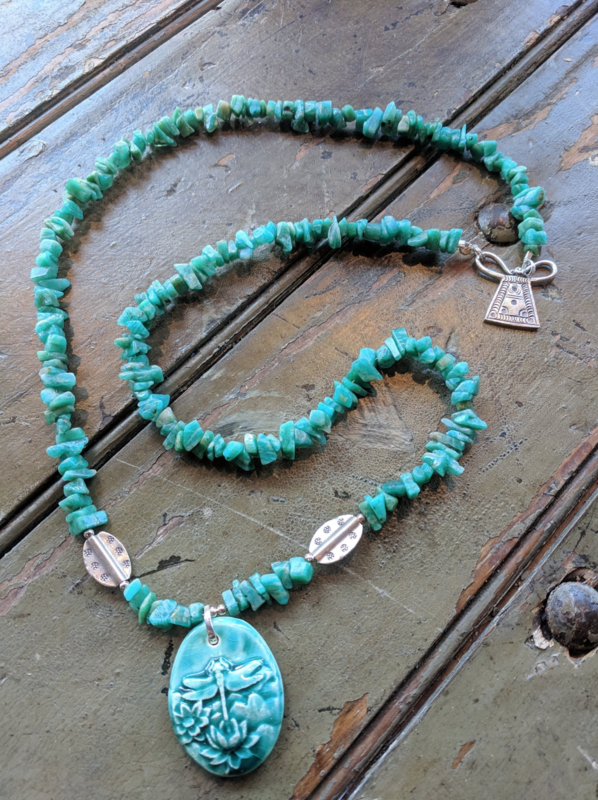 “Transcendent Spirit”: This 30” amazonite necklace with a 1 1/2” porcelain pendant of a dragonfly and lotus is as unique as you. The accents are sterling and Hill Tribe silver, ending in a spirit lock amulet. 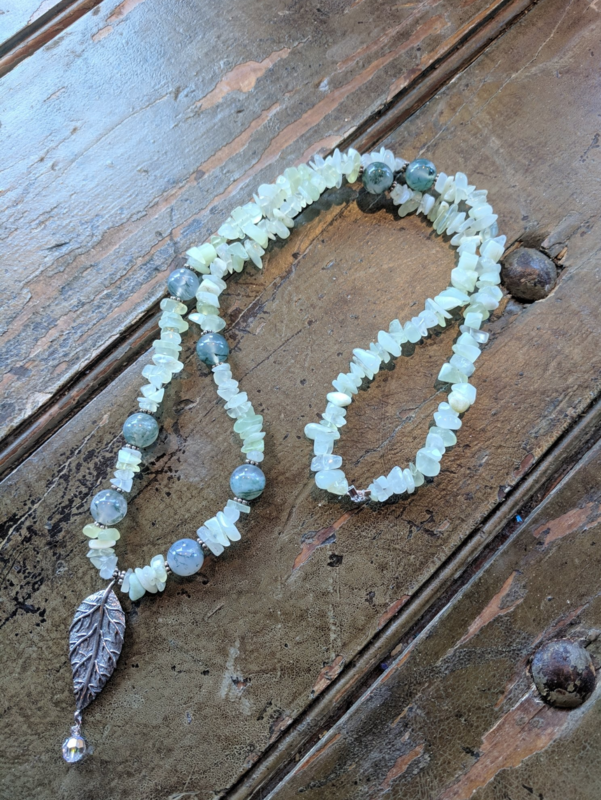 “Dew Drop”: 25” of jade beads and chips end with a pendant of a 2” sterling silver leaf and a single Swarovski crystal. Sterling silver accents. 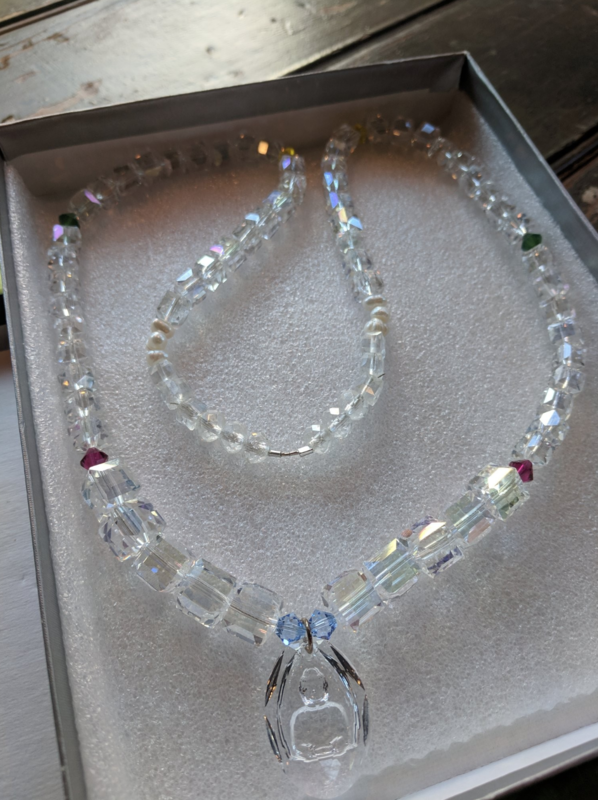 What excites you about making jewelry? 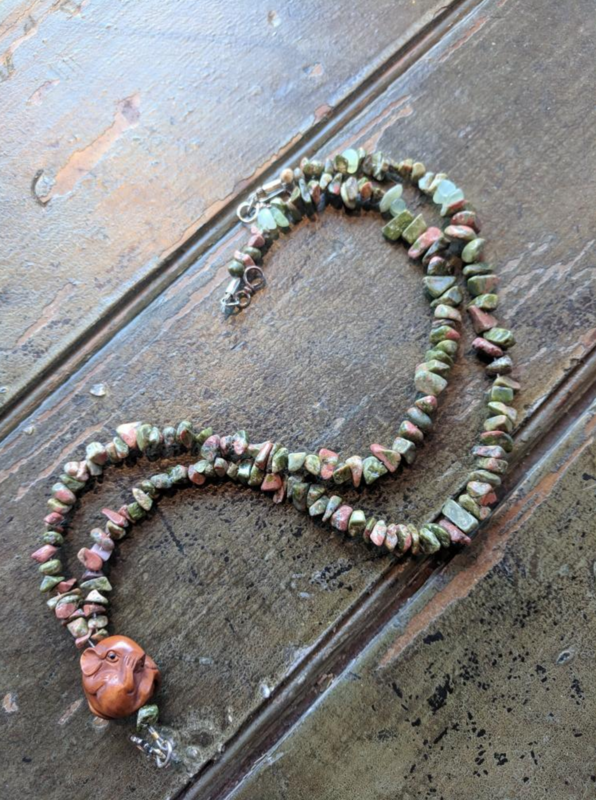 Jewelry making has come to me as a natural progression of my life’s journeys. As a student and teacher of literature, I was lead to philosophy, which led to the healing paths of nurse and reiki master. Through an apprenticeship in plant medicine, I was introduced to shamanic practice. These connected me to healing, to the plant, animal, and mineral realms. I express this in healing ceremony, and in making jewelry, medicine bags, and (untraditional) malas. It is an intense, utterly absorbing process to find materials that “speak” to me, and then fashion them into one of a kind objects of beauty, harmony, and healing. Also wonderful is to work with a client, finding, for example, a mineral energy that resonates with their esthetic and wholistic sensibility. Has technology influenced your creative process? In the broadest sense, the on-line world makes supplies, images, and information available to me from a multitude of sources, far more extensive and intriguing than I would otherwise have encountered. How can interested people learn more about your work? Please contact me at my business, Breath, Spirit, Wind at the email address of lioraruah@gmail.com.